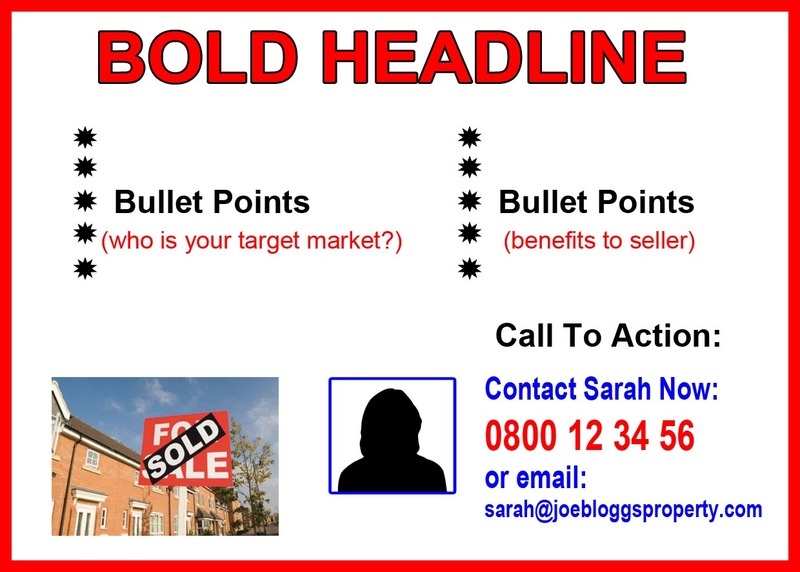 I recently talked about using flyers/leaflets to ‘find’ motivated sellers. If you can contact the seller BEFORE they contact the Estate Agent you have a much better chance of getting a good discount on the property. I have used this method several times and can honestly say IT DOES WORK! If you’re a new property investor looking to source bargain properties you need to be able to find motivated sellers and distributing flyers/leaflets is a great way to do this! I had a ‘motivated seller’ contact me because he needed a fast sale as his house had been on the market for over a year and not sold. As he’d moved out of the property and it was standing empty he just wanted to get it off his hands. One of my leaflets was given to him by his daughter who’d received it through her door and he called me to discuss selling his house quickly. What Should The Leaflet Say & How Should It Look? Anyone can write an advert on a piece of paper, but if you want yours to stand out from the competition it has to attract attention. I am not saying you must design your leaflet this way, or that my way is best. I’m merely stating what I have learnt from my courses, others experiences and trial & error! It’s up to you to make your own decisions and use whatever information you feel will be of benefit to you. A5 is most commonly used (approx 21cm x 15cm) horizontally or vertically, whichever suits your design best. You can use one side of the leaflet or both. It hardly costs any extra to have double-sided leaflets printed so you may as well use the extra space. Use a relevant heading: The heading is THE MOST IMPORTANT! It’s no good slapping your company name across the top as ‘Joe Bloggs Property’ isn’t going to mean anything to someone who’s looking to sell their property fast. Make it big and bold so that it stands out. It has to offer something that your target market ‘wants’. It has to be ‘to the point’ and provide a solution to their problem. A good tip is to ask a question, ie; ‘Do You Need To Sell Your Property FAST?’ ‘Are You Looking For A Quick House Sale?’ ‘Do You Have Property Problems?‘ These are questions that motivated sellers can identify with and will make them want to read further to see what you can offer them. Are you stuck in a chain? Are you relocating and need a quick sale? Get an offer in 24 hours! Offer something FREE: People love to get something for nothing! So the word ‘FREE’ tends to get noticed. Use photos and testimonials: People feel reassured if they can see that someone else has used your service and was happy with it. It’s obviously much better to use genuine tetimonials, however, I appreciate that it’s difficult when you’re first starting out to have ‘genuine’ quotes, but you could use a testmonial from anyone you’ve helped in the past who can vouch for your character ie; a friend that you’ve done a good turn for. Psychology: Use photos of houses with a ‘SOLD’ sign outside. People will associate this with their own house being sold. Use Scarcity: How many times have you responded to an advert because there was a ‘time limit’ on it? People don’t like to think they’re ‘missing out’ on something good, so if they think there’s a bargain on offer but it will be ‘sold out’ if they don’t act quickly then guess what, they’re more likely to act immediately. Colour or black & white? There’s been a lot said about this aspect and as I’ve never used black and white leaflets I’m not in a position to advise what’s best. It’s been debated that it doesn’t really matter as it’s THE CONTENT that matters most. I think you should try both and see whether it makes a difference, however I like to use colour as it looks ‘nicer’ and stands out better. If you’re going to use colour, don’t overdo it, it will end up looking fussy. You don’t need to use more than three colours and primary colours work well as they ‘stand out’ better. This goes for fonts as well, try to stick to the same font in not more than three different sizes. 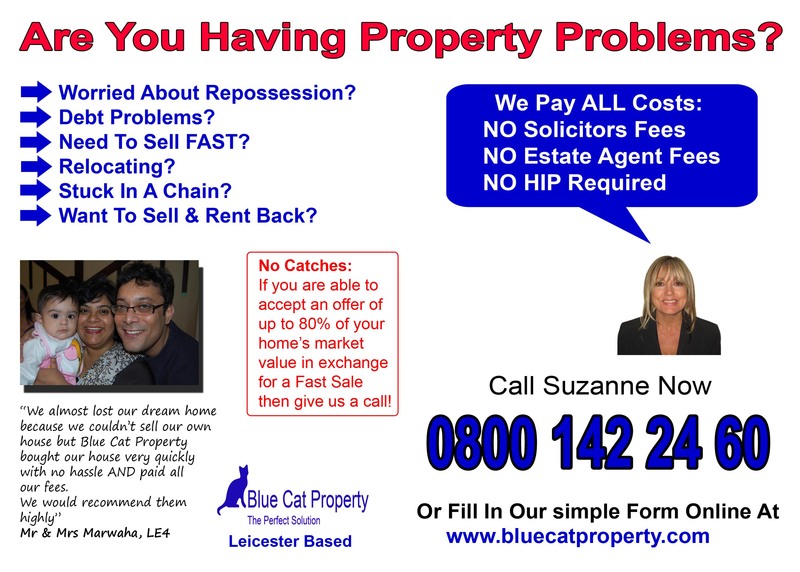 I use Photoshop to design my leaflets, in fact I use it for lots of things! You can just as easily use ‘Word’ or ‘Paint’ or if you’re not feeling very confident about designing your own, most printers will design one for you at a small cost. Terminology is important. Personally I prefer to use the words property or house rather than home. The word ‘home’ is emotive, it’s personal and refers to a place you have ‘made your own’ with your family. You’ve heard the expression ‘turn a house into a home’, they are two different things and people can be defensive if they think you’re trying to ‘take away’ their home or suggesting it’s worth less than they think. Call to action: (your contact details) This should contain your telephone number, email address and website details (if you have one) and needs to be clear and prominent. Apparently it’s better to use a female contact name as these are seen as being less agressive and more approachable. Should you use an 0800 number? Again this is debateable. An 0800 number is free to call from a landline but you are charged if you call from a mobile, so it would depend where the seller was calling from. Some people feel it’s more personal to have a ‘local’ number on their leaflets or a mobile number. You could use both. Previous How To Get On The First Page Of Google Without Trying! Next Why Is It Important To Network? another great post, I really enjoy reading your blog. A funny thing leaflets…like all marketing it is worth split testing leaflets. The first one I did broke all the rules (company header at the top etc etc) and got a great deal for the vendor and me from 10’000. The next lot we sent some 60’000 out and got only one deal but the leaflet followed all the rules and had been tested buy others with great results????? Doing a great job. Keep in touch. I have been very busy due to work and health problems in the family. Would love meet up some time. Wishing you a very Merry Christmas and Happy New Year. Thank you very much for this info. I have been sat here for hours trying to revamp my postcard leaflet I used 2 years ago. I have just joined TMA but not bought anything for past 2 years(using the leaflets). Your info has just put everything into pespective. I wish you printed A6 bcause your price is very competitive but I prefer the A6 postcards, they worked better for me.I just e-mailed you so that you can design it for me.